Fuerteventura is famous for its gorgeous beaches, ranging from stretches of white sands in the south, to the odd black sand beaches in the north. 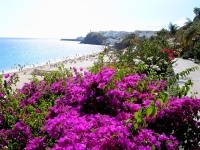 There are also charming little villages and harbours to enjoy, and a laid-back ambiance that characterises the entire island, making relaxation a welcome and inevitable consequence of visiting here. Fuerteventura does not have the glamorous nightlife or high-end attractions of some other Balearic destinations, but those coming here to enjoy its wholesome charms will not be disappointed. 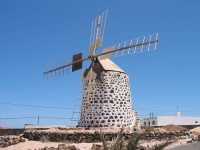 Puerto del Rosario is the main town of Fuerteventura, and the most popular resorts are Correlejo and Caleta del Fuste, but to really experience local charm travellers should head to rustic little villages like El Cotillo and La Oliva, or the historic old town of Betancuria. The island's regular winds make it a good destination for water sports like windsurfing and kite surfing, and other fun activities include glass-bottomed boat adventures and camel rides on the beach. 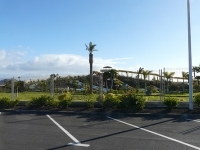 Families travelling with kids should try out the Baku Water Park and Fuerteventura Oasis Park. 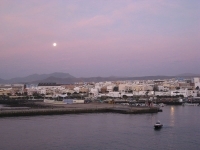 Car hire is good value and most visitors tend to rent a vehicle by the week to get around Fuerteventura at their leisure. Public transport is decent though, with reliable and cheap buses, and ferries which are useful for getting from one side of the island to the other. If you are going to use buses regularly during your visit invest in a Tarjeta Dinero, a bus discount card.